What is post-rock? In essence, it seems, and this is by no means a definitive explanation, it is music which utilizes guitar, drum, bass and keyboard in an often multi-layered way to create lush soundscapes that have a lot in common with early 90s shoegaze bands like My Bloody Valentine from Britain, but which also hark back to some of Velvet Underground, Talk Talk or even PiL’s more esoteric moments. They tend to eschew the use of vocalists, and if they don’t they use them more as hired hands or guest singers than major components of the band. 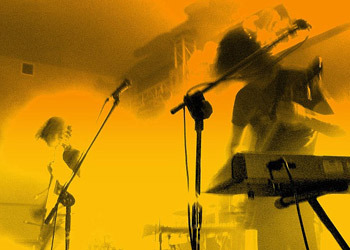 Right now, it seems, post-rock bands are coming out of the woodwork with a mix of breathtaking and not so impressive results, depending on which bands you listen to. Godspeed! You Black Emperor, Explosions in the Sky, Sigur Ros and Mogwai are some of its best exponents. All of the above have been kicking around for a decade or so, and most would, rightly, reject being compared to one another. Last month, we were treated to three up-and-coming bands from this genre, if it can be called that. First up, Arms and Sleepers, in new venue Forty Kleparz, on 10 May. Essentially a two-piece, the band has fleshed out on tour to a foursome, hiring a vocalist and drummer to replicate their complex sound to a live audience. The band are inspired by film, particularly the work of Besson, Almodovar, and French new wave; this is reflected in the very audio-visual feel to the gig, with TV screens around the cavernous venue flashing up images to go with the eerie, at times ethereal, music. “Black Paris 86”, a title redolent of where the band’s heart may lie in time and place, hauntingly chimes, in a Portishead “Sour Times” kind of a way, the keyboards and insistent drum-beat transporting you to a warm and yet unfamiliar place. The layered, textual feel of the music – hard to transfer to a live stage – is played with skill and charm, and the addition of a falsetto vocal gives a Sigur Ros-like tinge, or perhaps a touch of the Album Leaf. It’s a dream-like performance, enhanced by the striking images; rhythmic electronic pulses are layered one atop another, and songs blend seamlessly together – a patchwork of ideas that together form a meaningful whole. The band’s sleepy melodies offer tranquillity. In contrast to this, we have God Is An Astronaut, supported by Butterfly Explosion and Junius, who played 16 May. Hailing from Wicklow, Ireland, this three-piece use volume and noise control to make epic lands of sound and energy. Being only three members, the band produces music that sounds like much more than the sum of their parts and they are obliged to do musical gymnastics in their stage show to get things done. Kwadrat (The Square), out of town and desolate in studentville, along with the unseasonably wet and windy weather, provide a fittingly gloomy and introspective backdrop. GIAA arrived on stage shortly after 9 pm and opened with “Echoes”. What strikes me at first is the lack of visuals to go along with the music, as I had read that GIAA gigs are usually a full-on audio-visual experience (a common thread running through post-rock bands). Still, the music and lighting are impressive, and as the opening song closes to blinding green strobe lights, the band segue into “From Oust to Beyond”, a slow-burner which builds up with a drum loop and keyboard intro to an ominous but dramatic finale. “The End of the Beginning” follows. Torsten and Niels’ intricate guitar work is the driving force, but the insistent and regimental drumming of Lloyd combines to good effect and the overall feel is to create moody, dream-like atmospherics. “Suicide by Star” is the band’s finest moment for me, and it recreates a kind of 2001 Space Odyssey feeling – another slow-builder that ends with a pulsing, rousing drum finale that makes the hair on the back of your neck stick up. God is an astronaut, and he wants you to fly – just listen and see. Finally, Caspian played on the 17th in Łódż Kaliska, amply supported by Swedish youngsters EF and U.S. band Constants. Both support bands impressed, and Caspian had plenty to live up to. The band’s name conjures up an image of a place which is distant, isolated, given to moments of calm and storm; on stage their wall of guitars suggests choppy waters for the most part; from the visceral onslaught of “La Cerva” to the ten-minute drum-beating finale of “Sycamore”, Caspian demonstrate an ability to move between moments of rage and reflection. You get the feeling that the band is trying to push the envelope, and develop an art-form into something that will be remembered in years to come. The energy that comes off the stage during the performance is palpable, and the small venue rocks to their coruscating riffs. Caspian, like GIAA, make you forget about vocals, and aim to make their music seep over and into you, immersing you in sound until you submit to their world. These guys are not mere musicians, they are architects of sound, creating vast caverns and valleys, abundant in beauty and depth, drawing you in to get lost and then guiding you back to reality. Maybe in a sense we are coming to the end of rock; what is there left to say in words that hasn’t already a thousand times? As the most unlikely post-rock visionary Dave Gahan once sang, “Words are very unnecessary – they can only do harm”.